RBTH presents a selection of views from leading Russian media on international events, featuring reports on the 20-year prison sentence handed down to former president Mohamed Morsi in Egypt, Islamic State’s declaration of war on the Taliban and the potential participation of U.S. President Barack Obama in the peace negotiations on Ukraine. The Gazeta.ru online newspaper reports that the first democratically elected Egyptian president, Mohamed Morsi, has been sentenced to 20 years in prison. He is accused of arresting and torturing political opponents, while his predecessor, authoritarian president Hosni Mubarak, was acquitted of the same charges. Gazeta.ru writes that the introduction of an Islamic order in Egyptian society made many classes of the population rise against the president. In 2013 he was removed from his position by the Egyptian military with the active participation of General Abdel Fattah al-Sisi, who subsequently became president of the country. Al-Sisi then banned Morsi’s party, the Muslim Brotherhood. Now Islamic militants are waging an armed fight against the Egyptian government, writes Gazeta.ru. 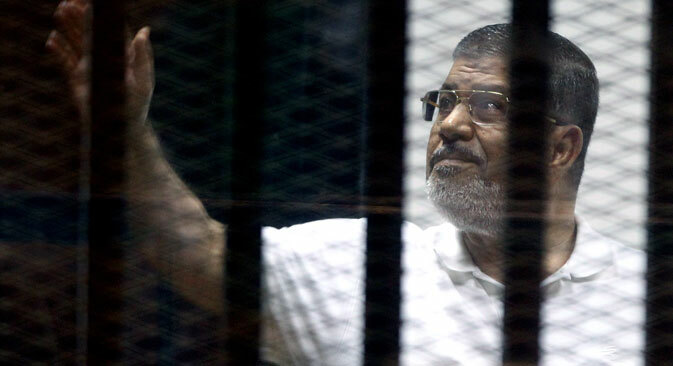 Alexander Shumilin, Director of the Center of Analysis of Middle East Conflicts at the U.S. and Canada Institute, believes that Morsi's sentence is "politically motivated": "The sentence is a message to the Brotherhood that the president will continue Mubarak's oppression of them." In the opinion of Ernest Sultanov, coordinator of the Mir Initiative Expert Group, having jailed Morsi and his followers, the government "is creating a system of hostages." "They are either jailing the leaders themselves or their children with the hope of avoiding a harsh reaction from the Muslim Brotherhood," says Sultanov, noting that this will not help because it will bring more radical groups to the forefront, in comparison to which the Brotherhood will appear a more moderate force. The centrist newspaper Nezavisimaya Gazeta reports that the militants from the Islamic State (ISIS) radical group and those from the Taliban have declared a holy war on each other. "The opposition between the two groups began some time ago," explains Omar Nessar, Scientific Collaborator from the Russian Academy of Sciences’ Institute of Middle East Studies. "However, its evolution will benefit Kabul, which is why the Taliban does not want an escalation." Nessar says that the development of the conflict shows that sooner or later it will transform into a violent clash. The “Caliphate” (ISIS) is still not ready to enter an armed conflict with the Taliban because of a lack of forces in the region, but a direct armed conflict in the upcoming months is inevitable. Regarding the future of the conflict, Nessar believes it is important to pay attention to the course of the negotiations between the Afghan government and the Taliban. According to Nessar, if key figures from the Taliban are incorporated into Kabul's governing circles, this will lead to indignation from the middle- and low-level militants, who may find shelter in the ranks of the Islamic State, writes Nezavisimaya Gazeta. The Moskovsky Komsomolets daily tabloid reports that U.S. President Barack Obama is ready to join the negotiations on regulating the situation in Ukraine in the so-called “Normandy format” (Russia, Ukraine, Germany and France), if he receives a special invitation. American Ambassador in Moscow John Tefft did not exclude this possibility during an interview with radio station Ekho Moskvy. Tefft said that he does not have direct information from the U.S. president himself about his opinion on participating in the negotiations, yet the ambassador believes that Obama would be interested, writes Moskovsky Komsomolets . Commenting on Tefft's words about Barack Obama being eager to participate in the negotiations on implementing the Minsk agreements in Ukraine, Russian Presidential Press Secretary Dmitry Peskov said: "If any country is ready and is capable of influencing Kiev to implement the Minsk 2 Agreements, obviously Moscow would only welcome this."